The aim of this thesis is to improve the characterisation of the physical properties of capillary active materials employed in the internal insulation systems. One of the most important properties is the liquid water diffusivity Dw, which is evaluated by means of a new approach based on the Guarded Hot Plate Apparatus, which, under a temperature gradient, generates a water content difference between the upper and lower surfaces of the specimen. 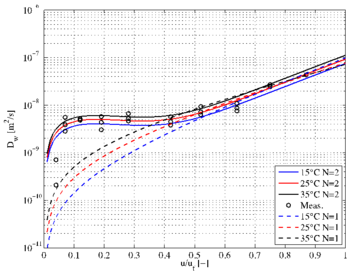 Determining an approximated water content distribution, the calculation of the liquid water diffusivity is possible when steady state conditions are reached. The innovative aspects are the simplicity of the method and the possibility to know the temperature influence on the liquid water diffusivity. Then, by means of the interpolation of the empirical data, a new semi-empirical distribution function of the liquid water diffusivity is proposed. The validity of the method is verified by means of a numerical simulation implemented in Comsol Multiphysics. Moreover, a case study describing the real response of an existing wall is analysed by means of a numerical model implemented in Comsol Multiphysics, in order to study the behaviour of the wall with respect to the risk of mould formation, which occurs at the interface between the insulating layer and the external wall. The Isopleth model is taken into account, which allows establishing if the condition of relative humidity and temperature behind the insulation is risky of safe. Finally, a new method able to predict the risk of mould formation in a preliminary and conservative way is presented, without employing a numerical simulation and overtaking the limit of the existing Glaser method, cannot describe the behaviour of capillary active. 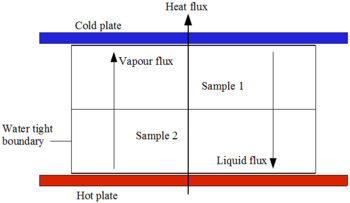 This limit is overtaken by the method here proposed, which analyses the vapour flux and the water liquid flux inside the material. The method presented is further validated by means of a numerical simulation by Comsol Multiphysics.